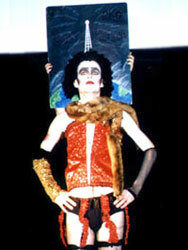 When the Castle Transylvanians performed The Rocky Horror Picture Show for the first time on April 8, 1994, there were four people and a cape. Lisa Wood and Jeff Baker, through hard work and dedication, have transformed that cast into a cast of approximately 30 members and have put together what is considered to be one of , if not the best, show on the east coast. But Lisa and Jeff did not do it alone. Our theater, Towson Commons General Cinemas, has been very supportive from the beginning. Lanark Thornton, our theater manager, has supplied us with a storage area and has fought to keep us from closing on many occasions. We thank him from the bottom of our hearts. We also owe thanks to the media coverage we have been given, including local TV station Channel 11 as well as several local university papers. We've had three graduate students and two high school students do major projects and all of these things have helped to draw our audience. We can also be seen in Creatures of the Night II on pages 108-109 and a picture in the color section. However, the biggest thanks must go to the devoted cast members who sacrifice their free time to make our show exceptional. We would not have the great costumes we have if not for Karen Savage. If we did not have cast members like Jen Wiechert, Christy Thorndill, Ken Weitzel, and Arthur Levesque, our props would not have been built. Our cast wants to be the best show and all of the hard work and dedication has paid off. While some may criticize our show for being too straight, we choose to perform this way. It is fun and we look at is as a healthy competition between us and our fellow castmates as well as other casts. We are not forced to play this way, this is what is fun for us. We also enjoy learning props, lights and blocking so that we can be as close to exact in comparison with the movie. 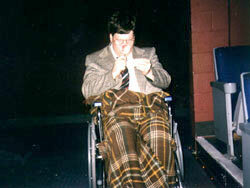 We also have always enjoyed having people with other casts perform with us. We have always had an open invitation for anyone to use our theater, props, costumes, and even makeup. Many people have taken us up on the offer including Bill Brennan, Perre Poley, members of the Edison NJ cast, Jason Alan Pfaff, and several members and ex-members of the Harwan cast such as Joe Martin, Anne Kruse, Dave Meyers and Jen & Glenn Walker. We, too, have traveled. We've done performances at the Andelusian Dog in D.C., Shennandoah, VA and annual shows at the MD Institute of Art. Representatives have gone to conventions in Boston and, of course, L.A.. In Boston and L.A., members of our cast performed in a tribute to Shock Treatment. In LA three out of four of our members who entered the costume contest made it to the finals. Erika Mueller won (tied) the contest for Frank with a cast costume. We are enjoying our success and do not plan to stop here. In the near future we are planning to add new props including a jukebox, a car and maintain the quality of the props, costumes and lighting we already have. Sal Piro is tentatively scheduled to attend our show for the second time on May 18, 1996 and our own production of Shock Treatment is already in the works. If we sound conceited, it's only because those who have seen us make us this way. If you think we can not live up to our reputation, then come see for yourselves. We perform every Friday and Saturday night at Towson Commons on York Rd. and Pennsylvania Ave. Phone number is (410) 825-5236. Admission is only $2, so bring a bunch of people and prepare to "give yourself over to absolute pleasure"!